Litecoin [LTC]’s prices are currently soaring as high as $35 and the market cap has hit the $2 billion mark. The 24-hour price change for Litecoin is 16% and most of the trade volume is coming from Korean exchange Coinbit, which is contributing $280 million [32% of the total trade volume] in trading pair LTC/KRW. According to CoinMarketCap, the prices for Litecoin started trading at $29.85, the prices rallied from this point without any roadblocks until it reached a high of $35.25. The market cap of Litecoin also saw a dramatic increase of $400 million and was holding steady at ~$2.1 billion, at the time of writing. In a longer time frame of 7-day, the price action for Litecoin can be noticed. The prices can be seen dipping as low as $27, which was last seen in May 2017. The market cap in the 7-day time frame reached a high of $2.74 billion and a low of $1.6 billion. Litecoin is among the altcoins that have taken the worst hit by the 2018 bear market. The bear market, as a result, caused the Litecoin’s prices to dip as low as $27, which is a total of 92% decrease since its all-time high in Jan 2018 [$367]. Despite Litecoin seeing massive real-world adoptions, the community is talking about the tweet by Charlie Lee last year. People in the community are talking about how Charlie Lee predicted Litecoin’s fall. 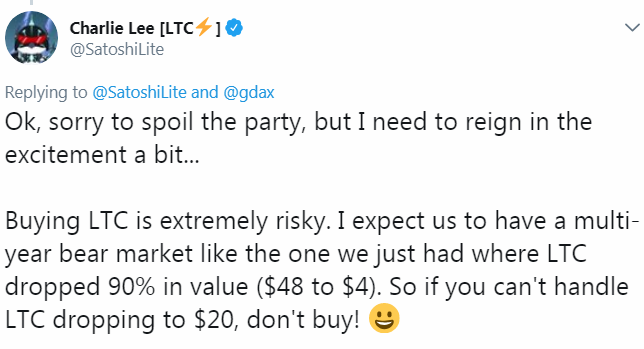 The community thinks that Litecoin did break the 90% depreciation point as predicted by Charlie Lee. “This is why we listen and trust Charlie Lee. He is the smartest crypto guy with the most experience in these cycles. I never sold a dime. Rode through it all. What a ride. Looking forward to December 2021.